Studioware has been optimized to work on all devices. It works on your large desktop computer, laptops, on Apple iPads or Android tablets, and it will work on your iPhone, Android Smart Phone, or Windows Phone. No Software to Install or Data to Backup. This state-of-the-art software stores all your information on a secure Web server. Your data is secure and encrypted with Studioware. Offer online registration, enrollment, and payments. Email your students, families, and payees professional invoices that can be paid online. 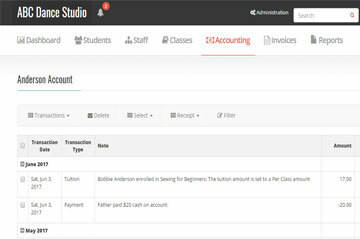 Keep your classes full and your accounts receivable up to date! 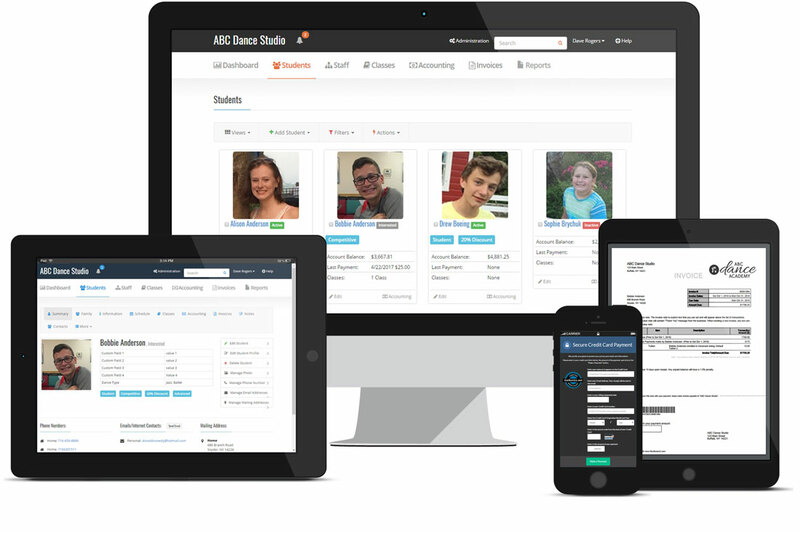 Manage your students, staff, families, phone numbers, emails, addresses, billing information, invoices, and account balances. 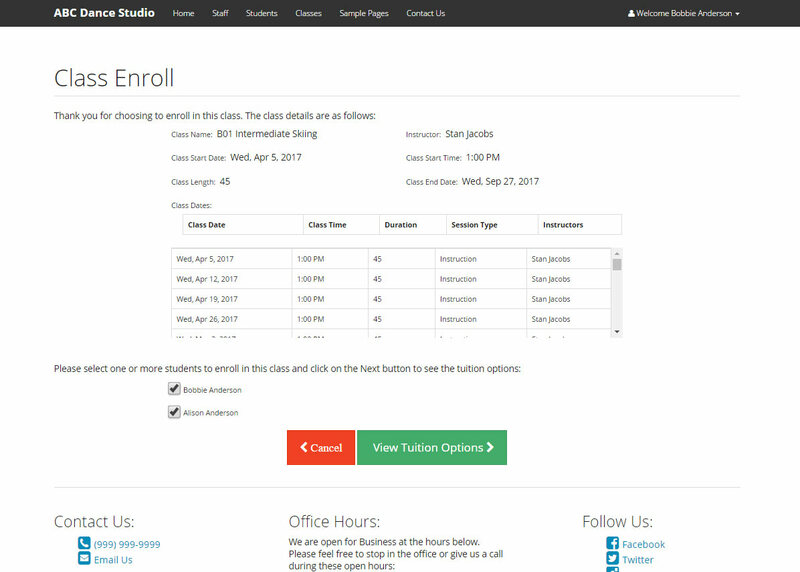 Studioware also lets you easily send emails to all students, active students, or students in specific classes. 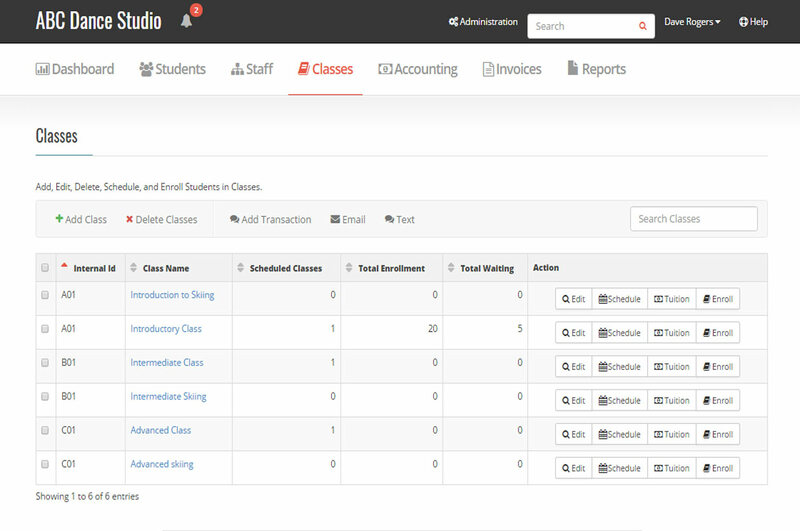 Manage all your classes, instructors, enrollment, waiting list, and attendance. Easily correspond with all students/families in classes. 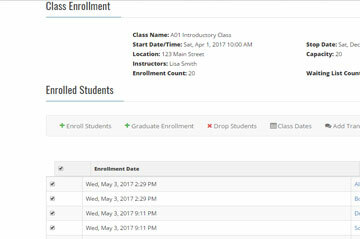 Allow you customers to enroll in classes directly from the business portal. 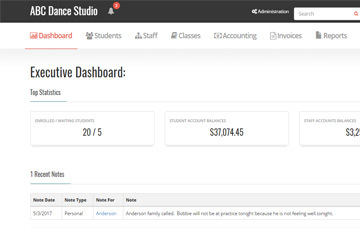 Studioware automatically calculates tuition charges, discounts, and taxes for your classes. 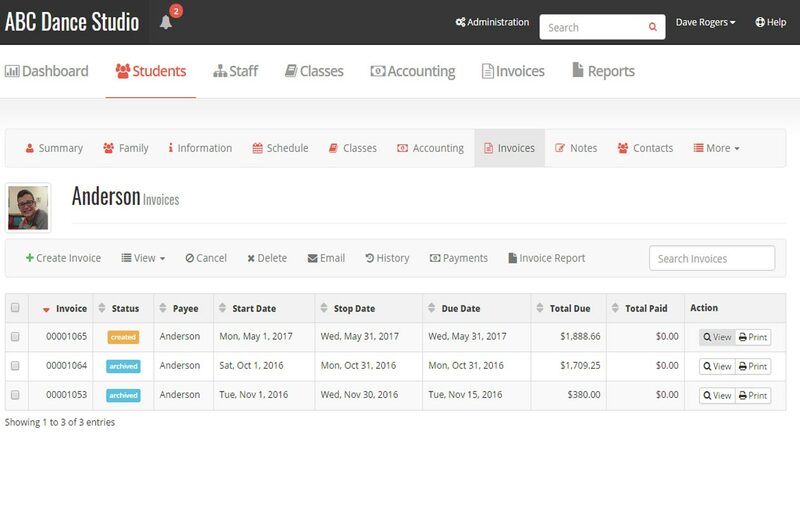 Studioware also contains full accounting functionality, so you can keep track of your accounts receivable and accounts payable. 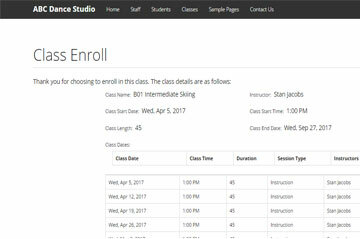 There are many options when defining classes in Studioware, including, Group Classes (scheduled class with multiple students), Private Classes (scheduled class with a single student), and Drop-In Classes (scheduled class where any students can attend any class date). 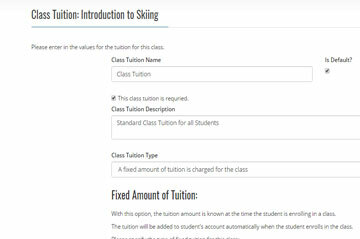 Studioware offers many different options when defining class tuition, include, Fixed Amount Tuition, Per-Class Tuition, Staff Tuition Rate, Student Rate, Class Count/Hours Rate, and Customized Dates Tuition. Multiple Tuition Items for a class are also allowed. 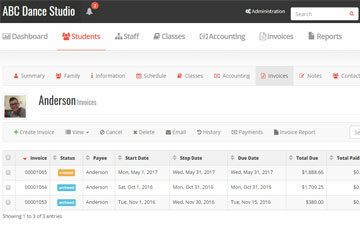 Create invoices for your students/families. Track the status of each invoice, and outstanding invoices. 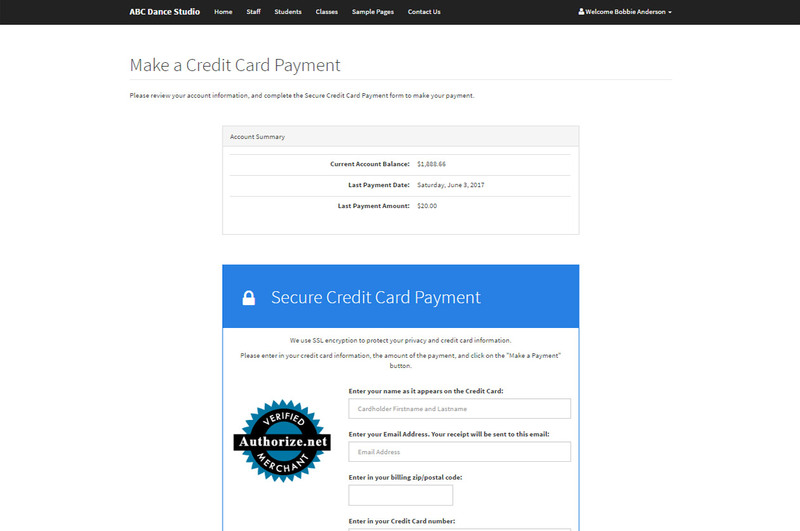 Allow you customers to pay the invoices online. Studioware allows you to create tags and assign them to students. You can then search for Students by tags, assign tuition by tags, and calculate discounts based on tags. Gain better insight into the financial performance of your business with the Studioware reports. Export your student data at any time. 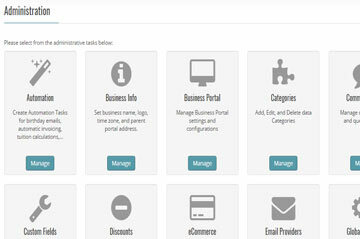 The Executive Dashboard gives you a quick "snapshot" of your Business. It has many key metrics such as Student Count, Total Class Enrollment and Total Waiting, Number of Student Enrolled, Outstanding Student Account Balances, Student/Staff Birthdays, Enrollment by Week Bar Graph, Tuition per Month Line Graph, and Recent Student Notes. 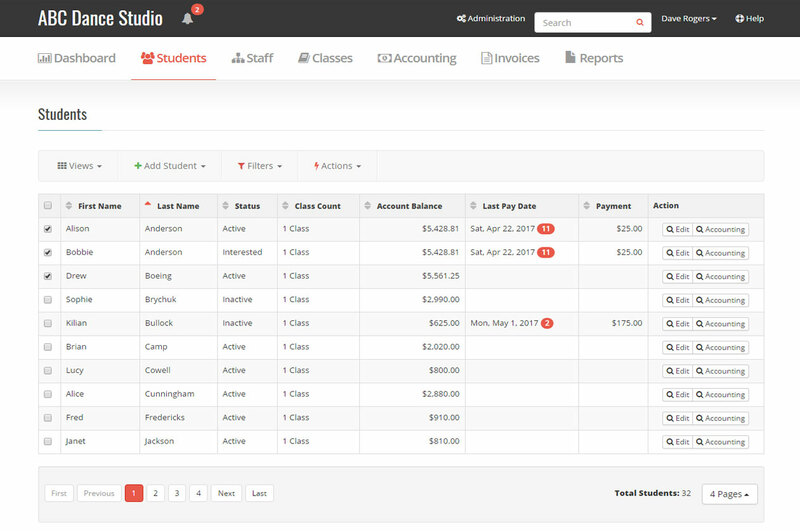 Displays a list of students defined in your business. 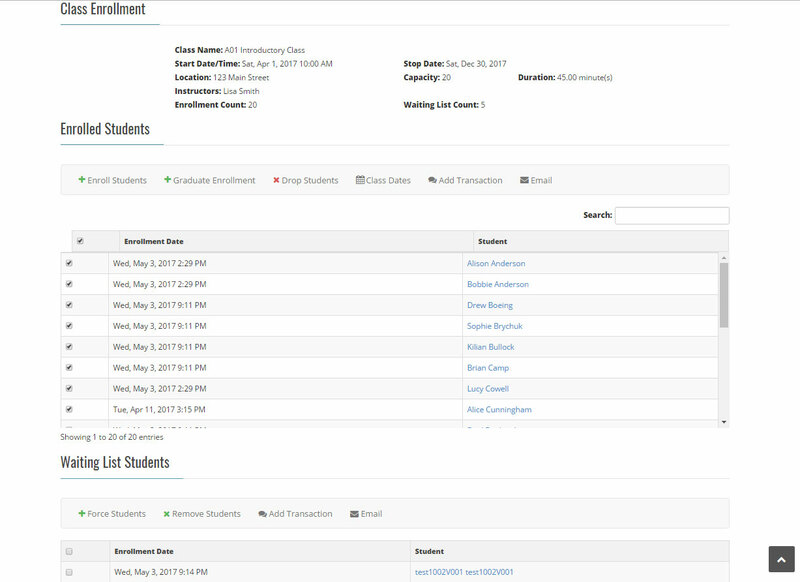 From this screen you can sort the students, add students, import students, and filter students by status, tag, enrollment, financial filters, and invoice filters. You can also select one or more students and perform actions such as send email or add financial transactions to groups of students. 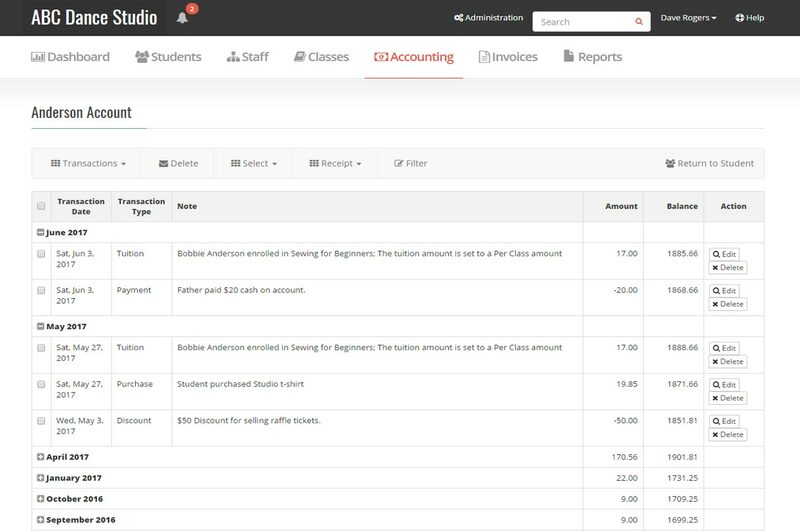 Studioware contains a full accounting module. An accounts receivable financial account is automatically created for each student. You can add, edit, and delete financial transactions from the account. Some transactions are automatically added to the account, such as tuition, registration, and payment transactions. Invoices are a convenient way to let you students, families, and payees know there is a balance due on the student financial account. Invoices are created, emailed to your customers, and their status tracked (such as sent, viewed, partial payment, paid-in-full). The outstanding invoice report helps you track unpaid invoices. Studioware allows you to track your staff members. 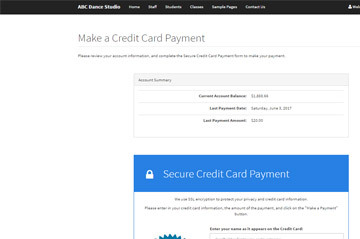 Each staff member created in Studioware automatically receives an Accounts Payable financial account, where you can track amount owed and amount paid. Staff member contact information, class schedules, financial/pay rates, notes, medical information, custom fields, and more. 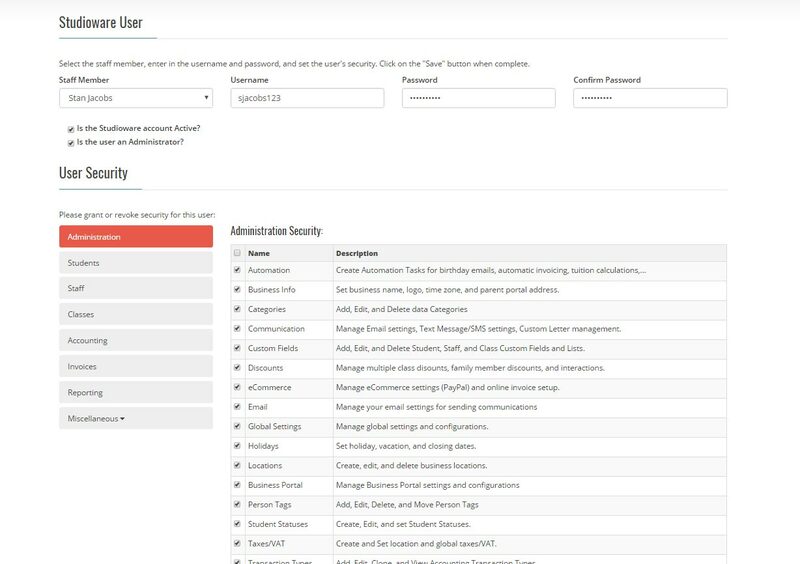 Studioware has many Administration configurations that allow you to configure the software to meet your specific business needs. 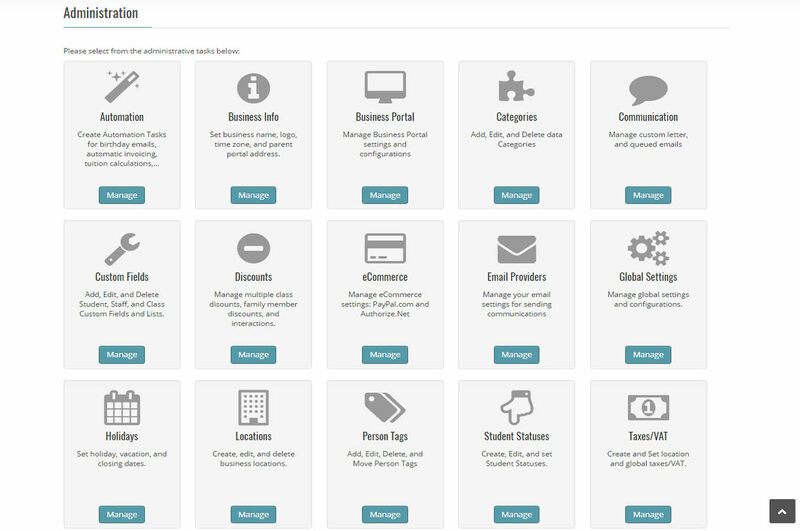 In Studioware, you can configure: Business Info, Business Portal, Communication, Custom Fields, eCommerce, Email Providers, Global Settings, Holidays, Locations, Person Tags, and more. 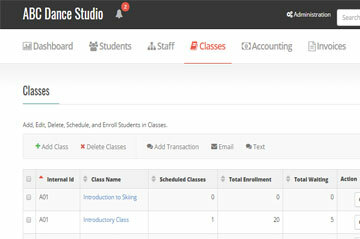 Studioware allows you to define group and private classes. 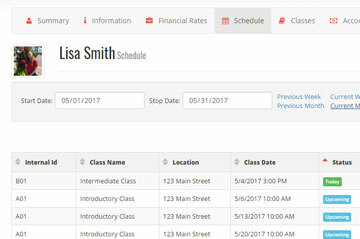 For each class, you can set the tuition, instructors, schedule, prerequisites, min/max age, capacity, and length. Additionally class options: online enrollment, waiting lists, drop students, enroll all students in a new class, email class, add financial transactions, attendance, and more. Studioware offers many tuition options: fixed amount, individual class amounts, staff member's tuition rate, variable based on count/hours of classes, student custom field, or customized dates/amounts. 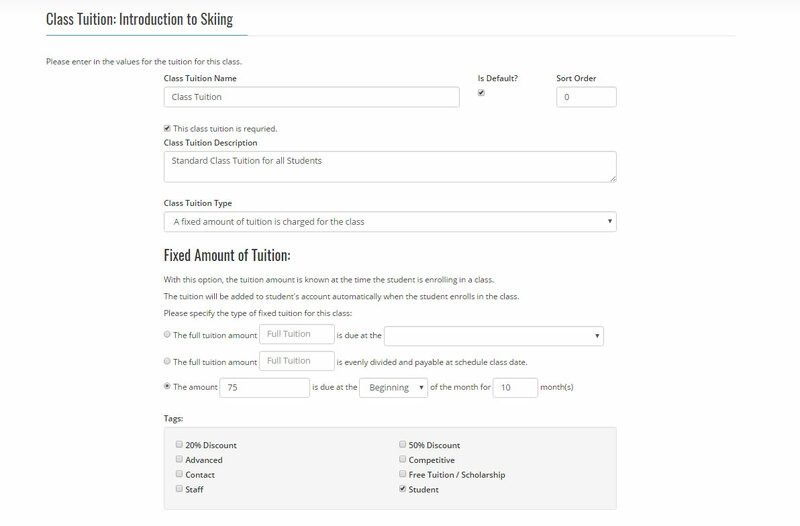 Studioware allows you to create multiple tuition items, and the appropriate tuition will be applied based on the student's tags. 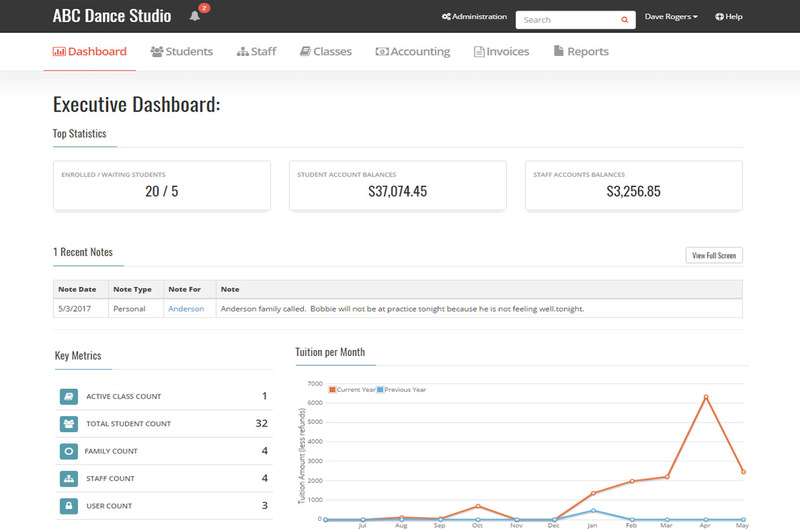 Studioware tracks your class enrollment, and automatically adds tuition charges to student accounts receivables. 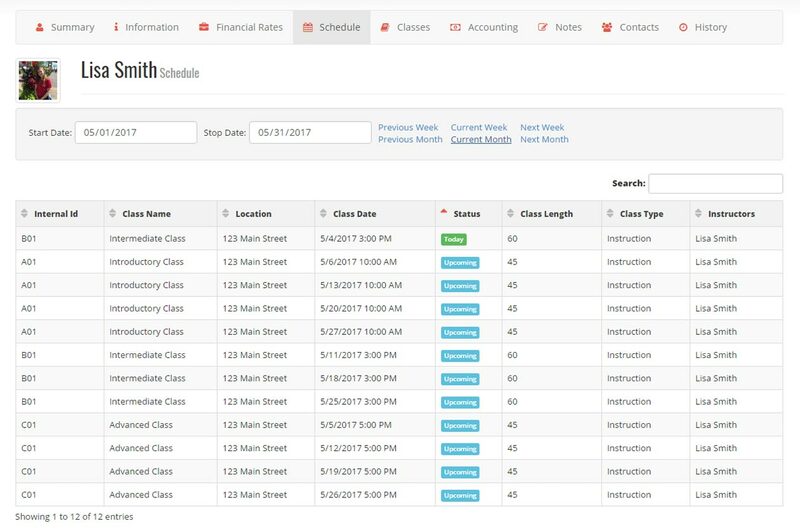 You can easily add and drop students, force students from waiting lists, email enrolled students, add financial transactions to enrolled students, reschedule classes, and easily enroll select students from one class into another. 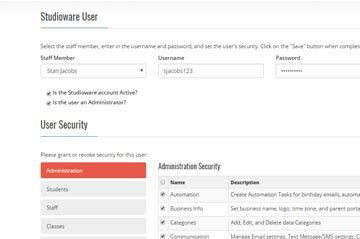 Studioware allows you to create multiple user accounts to access the software. We have an extensive security system that allows for fine-control over the functionality for each individual user. For example, you could prevent the front desk employees from accessing the financial reports, or prevent the billing employees from dropping students. The Studioware Business Portal allows your customers to enroll in classes, update contact information, view invoices and account transactions, and make payments. You can easily create additional business portal pages, menus, footers, upload images and documents, to create a full website for your business or easily integrate with your current website. Studioware is Online Class-Management Software for Dance Studios, Gymnastic Clubs, Martial Arts Dojos, Art Schools, Sports Clubs and more. 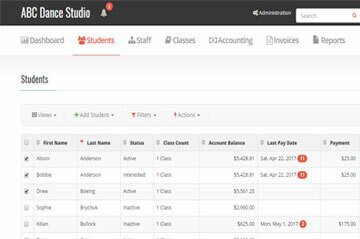 If your business manages students, staff, classes, tuition, payments, or schedules, then Studioware is the tool for you. Copyright © 2010-2017 by QuestWare, LLC.